The NORSOK Standard D-010 defines Well Integrity as “the application of technical, operational and organizational solutions to reduce the risk of uncontrolled release of formation fluids throughout the life cycle of the well”. This definition clearly outlines what Well Integrity is and where the solution is to be found. Well Integrity Platform (WIP) realizes that all three pillars; technology, operations and organization, should work together to achieve and advance well integrity. Hence, at WIP the education, research and development will focus on all the three pillars. The objective of this initiative is to build an independent international research and education platform at Montanuniversität Leoben (MUL) that will focus on well integrity problems and solutions. A Well Integrity Platform (WIP) has been set up in cooperation with the Chair of Drilling and Completion Engineering (CDC) and also a leading well integrity expert, Prof. Kris Ravi. WIP will consist of a globally connected network of members who need solutions for well integrity issues. With local and international partners (MUL chairs, international Universities, research organizations) it can offer unique solutions, services and answers to urgently needed and unsolved well integrity questions. The principal research tools that will be used are WIP Core Research, with results freely available to all members, and WIP Funded Projects, exclusively implemented for the benefit of an individual sponsor or for a member consortium in the form of a Joint Industry Project. The goal of WIP is to identify challenges and provide practical solutions in the design and delivery of barrier elements to assure well integrity for the safe and economic production of energy. Cement sheath, packer, casing, tubular, threaded coupling, wellhead, safety valve and cap-rock are examples of barrier elements that provide integrity during well construction and production. It would be ideal if all barrier elements were intact during the life of the well so that energy can be produced safely and economically. Failure of any one-barrier element may not compromise the whole integrity of the well immediately, but it can increase the risk in the long-term. However, failure of one barrier element could lead to a decrease in energy production, increase in water production, contaminate zones such as aquifers, diminish the economic outlook of the well and gradually corrode/degrade other barrier elements. It is essential to understand the purpose and interdependence of each single barrier element and the concept of the barrier envelope. This will help in the effective design and delivery of safe wells and should also assist in reducing the overall cost at every step, including when any remedial work is needed and also during plug and abandonment. 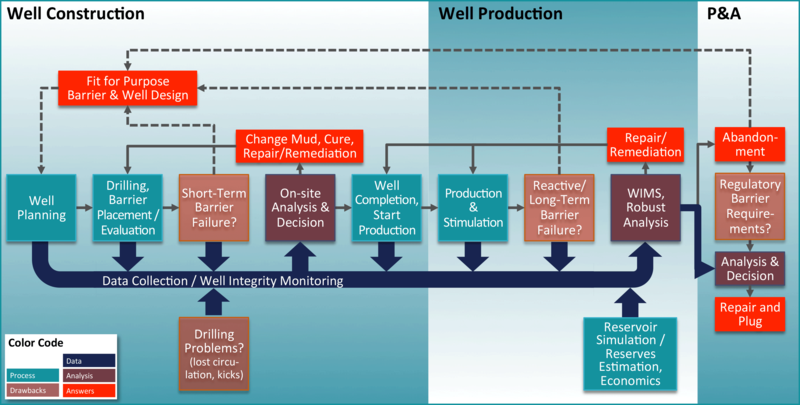 WIP will take a holistic view on well integrity over the complete life cycle of a well, as the requirements of the industry are multidimensional and differ from case to case. With highly qualified expertise in different disciplines, WIP will focus its research on the entire life cycle of a well, from well planning and well construction, over production and stimulation until plugging and abandoning the well (P&A). The objective is to reduce costs, improve efficiency, minimize wellbore downtimes and maximize profits. WIP will perform in-depth research on any well barrier element and on the nature of any short-term and long-term well integrity failures. WIP will collect and analyze “big data” from the entire life cycle of a well to assist in any critical well integrity management decisions in need of a more robust well integrity analysis. WIP will target old and new well installations, introducing fit for purpose barrier and well design concepts. A unique feature of WIP is to have access to MUL’s unique large scale testing facility close to Leoben, Zentrum am Berg (ZaB). To be competitive from the beginning, WIP will focus on market niches, regional requirements, cost effective solutions and intelligent products such as real-time monitoring during the deployment of barrier elements, which could help in their successful delivery. As technology advances, real-time monitoring of select downhole parameters during the life of the well could assist the industry to detect and prevent well integrity problems, avoid barrier failures and reduce remedial cost, increase energy recovery and safety as well as improve the economics of the asset. WIP will be a tool providing access ot well integrity issues worldwide, initiating international academic cooperation and creating projects to help platform members around the globe define their specific needs. Excellent international contacts have already been built up over the last few decades for example with the US, Brazil and with Russia. In this context, WIP will actively search for various international platform partners with unique and complimentary expertise and also set up WIP branches at dedicated locations. The results of WIP will be accessible to a large number of smaller stakeholders that at the moment are not able to participate in one of the rare existing well integrity R&D initiatives. WIP shall assist stakeholders to receive unbiased information and helping them to conduct their business in a more effective way. WIP will be an attractive and unique offer for systematic international research providing a platform for knowledge exchange on well integrity. This will be accessible to a large number of smaller stakeholders who are not able to participate in one of the rare existing well integrity R&D initiatives and who do like to work in an independent environment with excellent training opportunities. The WIP team and members of the Chair of Drilling and Completion Engineering have been actively involved in research relating to well integrity for decades. To create a holistic view, WIP will build on complementary expertise of key people in different subject areas such as well cementing, wellbore dynamics or drilling and production data analysis. The following list of publications is sorted chronologically; however, it represents just a selection of past team members’ activities and does not claim to be complete.